Quick TruCost (QTC) is the perfect solution for early-stage design and development costing requirements. It can be used as either a stand-alone system or companion to ETC. With the answers to eight or ten simple product questions, QTC provides an immediate prediction of total manufacturing costs with near-engineered cost accuracy. 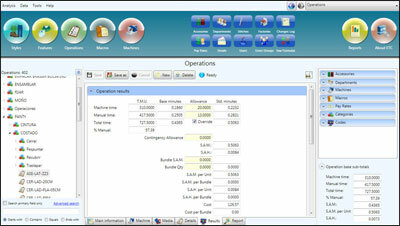 It uses information on common construction details to calculate total manufacturing time and cost. Full product costing can be accomplished in less than 10% of the time of standard data systems with no loss of accuracy. The highly affordable QTC system offers a quick return on investment by providing time savings, increased productivity, and improved early costing results. Engineered TruCost (ETC) is the premier standard data costing solution designed specifically for the fashion and sewn products industries. By describing the methods used to produce their products, engineers and other manufacturing professionals can quickly and accurately determine the time and cost associated with both complete products and individual operations and tasks. With ETC, detailed cost analyses are accomplished in minutes rather than days. This simple technique can be used early in the process to predict product costs with near-production accuracy and to evaluate the cost considerations of each change to the product. Armed with this highly accurate information, production and sourcing professionals can quickly and accurately predict product costs in advance of production, define operational best practices, plan for production and supply chain execution, and benchmark manufacturing costs against global standards. ETC is developed around a fourth generation Methods Time Measurement (MTM) statistical database. This precise standard data makes it possible to produce a logical, accurate, and consistent time and cost evaluation. ETC simplifies the use of this core data to create a quick and easy-to-use software solution that yields measurable benefits for all fashion and sewn products companies and professionals. Read about the latest ETC V9 solution.